Set upon a stretch of sandy dunes in Sri Lanka’s deep south, Jetwing Safari Camp welcomes you to the wild coast of Yala on the perimeter of its eponymous national park. Staying true to our promise of luxury accommodation across the island, our home of Sri Lankan hospitality offers a distinct ambience among villas in Yala with a unique beachfront glamping experience. 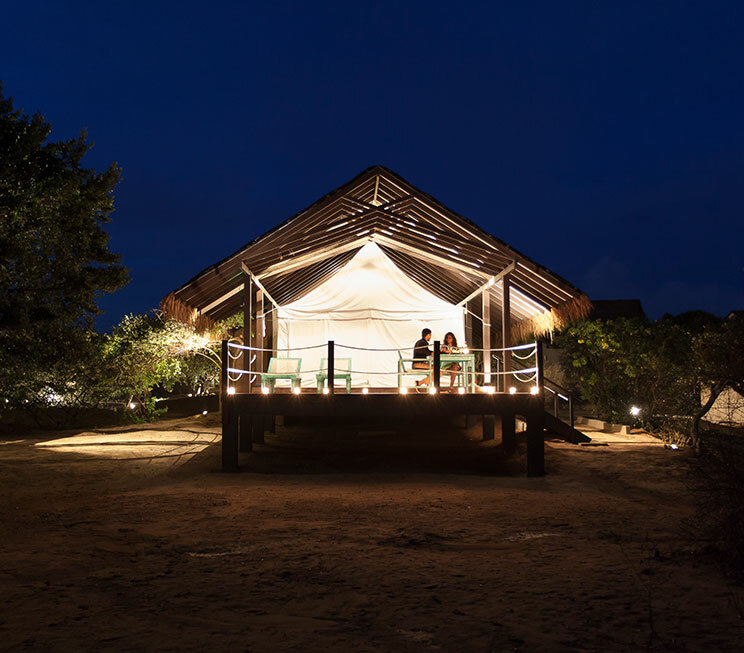 Raised above the vast coastal woodlands, each tented villa features a host of modern amenities and a timber deck that looks out over the horizon of the Indian Ocean. Should you require, additional facilities and services including a pool and diverse dining spaces are available with our family at the adjoining Jetwing Yala. Safaris can also be arranged to explore the wild marvels of Yala National Park – the most popular natural reserve in Sri Lanka, featuring the highest concentration of leopards in the world, alongside the habitation of several other exotic species such as elephants, sloth bears, deers, and more.